In complex systems there is a lot to pay attention to. Mindfulness and contemplative inquiry built into the organization can be a way to deal with complexity and help detect the weak signals that will make it thrive and be resilient in the face of challenges. Most human-centred social ventures spend much of their time in the domain of complexity. What makes these complex is not the human part, but the social. As we interact with our myriad beliefs, attitudes, bases of knowledge, and perceptions we lay the foundation for complexity and the emergent properties than come from it. It’s why we are interesting as a species and why social organizing is such a challenge, particularly when we encourage free-flowing ideas and self-determination. Because of this complexity, we get exposed to a lot of information that gets poorly filtered or synthesized or missed altogether. Yet, it is in this flotsam and jetsam of information that keys to future problems and potential ‘solutions’ to present issues might lie. This is the power of weak signals. But how to we pay attention to these? And what does it matter? A human social organization, which could mean a firm, a network, or a community — any collection of people that is organized by itself or other means — most likely generates complexity, sometimes often and sometimes occasionally. If we consider the Cynefin Framework, the domain of complexity is where emergent, novel practice is the dominant means of acting. In order to practice effectively within this space, one probes the environment, engages in sensemaking based on that information, and then responds appropriately. Viewed from another perspective, this could easily be used to describe mindfulness practice. Weak signals are activities that when observed across conditions reveal patterns that provide beneficial (useful) coherence that has meaningful potential impact on events of significance, yet yield little useful information when observed in discrete events. In other words, these are little things that get spotted in different settings, contexts and times that when linked together produce a pattern that could have meaningful consequences in different futures. By themselves, such signals are relatively benign, but together they reveal something potentially larger. One reason weak signals get missed is the premature labelling of information as ‘good’ and the constrained definition of what is ‘useful’ based on the current context. Mindfulness practice allows you to transcend the values and judgements imposed on data or information presented in front of you to see it more objectively. Mindfulness involves quieting the mind and focusing on the present moment, not the past or the possible implications for the future, just the here and now. It is not ahistorical, however. Our past experience, knowledge and wisdom all come to bear on the mindful experience, yet they do not guide that experience. Experience provides a frame of reference to consider new information, not judge it or apply value to it. It is what allows you to see patterns and derive meaning and sense from what is out there. A review of the research and scholarship on mindfulness finds a nearly exclusive focus on the individual. While there is much literature on the means of using mindfulness and contemplative inquiry as means of being active in the world, this is done largely through mechanisms of individuals coming together as groups, rather than the organizations they form as the focus of analysis. There is an exception. Social psychologists Weick and Sutcliffe (2007, summarized here and here – PDF) wrote about resiliency in the face of uncertainty using a mindfulness lens to understand how organizations make better sense of what they do and experience in their operations. In their manuscript, Organizing for High Reliability: Processes of Collective Mindfulness (PDF), they lay down a theory for the mindful organization and how it increases the reliability of sensemaking processes when applied to complex informational environments. It is notable that the aim here is not to reduce complexity (or impose simplicity), nor is it to focus on ‘positivity’, rather it is focused on events that help contribute to moving in particular direction. In that regard, this is not neutral, but it is not active either. It enables organizations to see patterns, focus on structures and information that encourages resilience to change, and contemplates what that information means (sensemaking) in context. Doing so provides useful information for decision making and taking action, but doesn’t frame information in those terms a priori. At issue is the development of consciousness of what is going on within your organization moment-to-moment, rather than punctuated by events. Events are the emergent properties of underlying patterns of activity. When we spend time attending to events without understanding the conditions that led to those events, we are doing the equivalent of changing the dressing on a wound in the absence of preventing or understanding its cause. 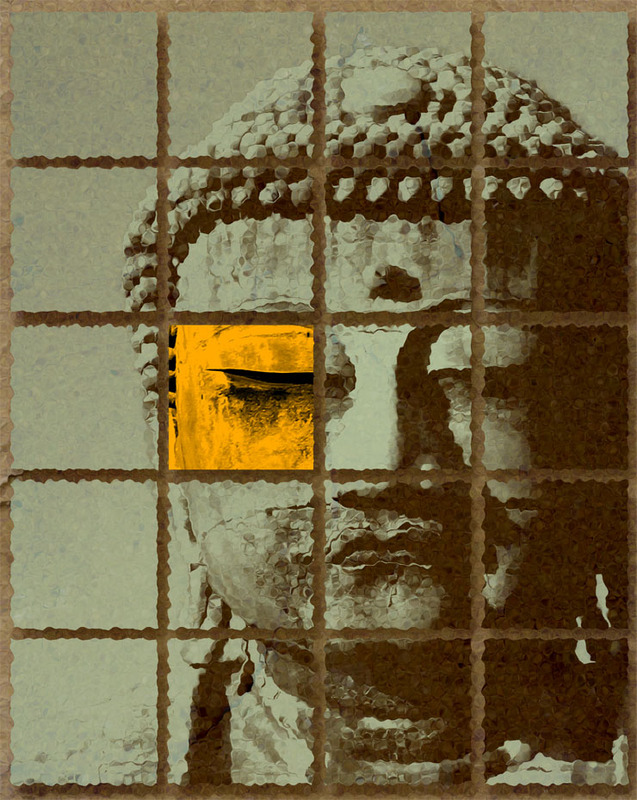 A mindful organization, like the image of the Buddha above, can emphasize the eye, but not at the expense of the rest of the picture. It is attuned to both simultaneously, noting events (e.g., like the square highlighted eye above), but that it is only through the underlying pattern beneath it that the highlighted context makes sense (the rest of the pictured squares). Yet, the only way the organization can learn that the yellow square is different or to ascertain its meaningful significance is through a sense of the whole, not just the part and that is social. Mindfulness and its wider-focused counterpart Contemplative Inquiry both have a root in attending to the present moment, but also in curiosity about the things that is brought to the mind’s attention. It’s not just about seeing, but inquiring. What makes it distinct is that it does not impose judgement on what is perceived not seeking to change it while in that state of mindful awareness. This judgement and imposition of value on to what is going on is where organizations can get trapped. In complex systems, the meaning of information may change rapidly and is likely uncertainty. The wisdom of experience, shared among others contemplating the same information without judgement, allows for a sensemaking process to unfold that does not impose limitations, yet also keeps a focus on what is going on moment-to-moment. Gathering this data, moment-to-moment, is what developmental evaluation with its emphasis on real-time data collection seeks to do and can serve as a valuable tool for organizing data to allow for a mindful contemplative inquiry into it that will illuminate weak signals. Creating an organizational culture where open sharing, questioning, experimentation, and attention to the adjacent possibles that come from the data and experiences from operations is the foundation for a mindful organization. This means slowing down, valuing non-doing instead of the constant push to action, cultivating contemplative inquiry and reflection, while also being clear about the directions that matter. Thus, strategy in this case is not divorced from mindfulness, rather it gently frames a directionality of effort. In doing so, it creates possibilities for innovation, attention to quality, and a mechanism for building resiliency within organizations and those working with them and within them. In creating these mindful systems we move closer to making sense of complexity and better prepare ourselves for social innovation.